Three years after The Avengers graced the movie world, its first sequel came out. Pretty much everyone involved with the first movie returned for Avengers: Age of Ultron, be it writer/director Joss Whedon, all of the core Avenger cast members, as well as Samuel L. Jackson as Nick Fury. They also brought in Ultron, who is among the greatest Avengers villains in the comics, and a couple more Avengers to join the team. The only major cast and crew members who didn’t return were Tom Hiddleston (Loki) and soundtrack composer Alan Silvestri. Development for “Avengers 2” began before the first movie released, along with plans for the other phase two films. In March of 2012, Whedon commented that he wanted the sequel to be “smaller. More personal. More painful.” Although as production moved on, the scope of the movie became increasingly larger, despite how Marvel Studios CEO Kevin Feige maintained that wasn’t their intention. He too wanted a more character focused Avengers film. At the premier of The Avengers, Feige commented that the studio had the option to bring Whedon back. Shortly after The Avengers’ success, they quickly offered him the sequel. Whedon said that he was undecided about coming back, but he didn’t find signing on for the sequel a tough decision. “When I actually started to consider it, it became so clear that I desperately wanted to say more about these characters.” There were a couple contractual issues concerning the film, one being that Robert Downey Jr.’s four picture contract ended with Iron Man 3. Looking at The Empire Strikes Back and The Godfather Part II as inspirations, Whedon completed an outline for the film by December 2012. Feige also commented that Captain Marvel appeared in an early draft of the screenplay, but since the character hadn’t been cast yet, they removed her. By that point, they had already created visual effects plates for Captain Marvel flying into Avengers Headquarters at the end of the film, which they instead used for Scarlet Witch. He also wanted Spider-Man to appear, but Marvel didn’t complete their deal with Sony Pictures Entertainment soon enough. More on that when we get to Captain America: Civil War and Spider-Man: Homecoming. They also planned to have the Hulk’s Quinjet detected near Saturn, setting up a “Planet Hulk” adaptation. Although they decided to cancel that and leave The Hulk’s fate ambiguous at the end of Age of Ultron, Thor: Ragnorok took elements from Planet Hulk anyway. The casting continued with James Spader signed on for the voice of Ultron. Months later, Elizabeth Olsen and Aaron Taylor-Hohnson were added as Scarlet Witch and Quicksilver respectively. Last but not least, Don Cheadle returns for a minor role as War Machine. There are plenty more interesting things to talk about with the production of this movie, but there’s also a lot to talk about with the movie itself, so let’s rush through the rest of this. There was actually conflict between Whedon and Marvel executives about the editing process. Disney executives weren’t into the scenes at Hawkeye’s farm or the dream sequences that Scarlet Witch gave the Avengers. Whedon also shot a much longer scene with Thor in the “vision pool”, but it was cut down after test audiences didn’t respond well to it. 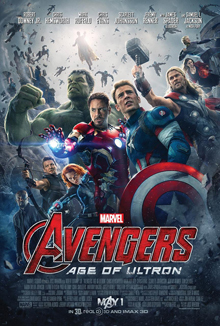 Age of Ultron ended up releasing in Europe on April 21st, and May 1st in North America. I remember this quite well because I was actually taking a family trip to England at the time, and my dad and I watched Age of Ultron a couple days before the North American release. I even wrote a blog post about my impressions that also went online before the North American release. My thoughts on the movie have changed since, but we’ll get to that. Age of Ultron featured a massive budget of $365 million, which unadjusted for inflation, makes it the second most expensive movie of all-time. Only 2011’s Pirates of the Caribbean: On Stranger Tides was more expensive, at $378 million. Despite this, it was still considered a massive success, earning $1.405 billion. That’s not as much as the first movie’s $1.519 billion, but it’s still a success. It enjoyed the biggest superhero opening day in history with $86 million, and the second biggest opening in history, behind Harry Potter and the Deathly Hallows – Part 2. However its opening weekend fell short of The Avengers, earning third place in history at the time. It also holds the record for the second biggest loss between first and second weekends with $113 million down, also behind Deathly Hallows Part 2’s $121 million loss. Overall, Age of Ultron is 2015’s third highest grossing movie, behind Jurassic World and Star Wars 7: The Force Awakens. I didn’t mention this with my Guardians of the Galaxy post, but both this and Guardians received very mixed reception in China, mostly due to poor translations. Some even accused Marvel of simply using Google Translate. I’m partly mentioning this as an excuse to show you some more of these Google Translate Sings videos. As for my own thoughts, well … that gets complicated. This movie seems to have all of the basic elements to make this a better Avengers movie than the first. It’s got a genuinely threatening villain in the form of Ultron. It’s got some great character moments, especially for the Avengers who hadn’t received much spotlight before. Hawkeye is especially expanded on. We see that he can be inspirational, that he’s got his doubts as the most normal member of the team, and that he’s actually got a normal life outside of his work. He’s perhaps the only member of the team with a normal life. It also makes him very different from the comics, but in a way that still feels faithful to his character. The movie also expands on the relationships between the different Avengers characters more. By this point, Steve Rogers and Tony Stark are close friends. They disagree a lot, but their disagreements are much more civil than in the first movie. Thor and Captain America are also fairly close in the field, and considering their mutual sense of duty, that fits perfectly. The humour usually flows quite naturally in this movie, most of it through character interactions in both combat and casual situations. There are a couple jokes that feel slightly out of place, but not enough to take you out of the movie. Because Ultron is a creation of Stark and Bruce Banner, there’s also a sense of guilt hitting the team hard. The fact that they’re fighting against other super powered characters makes the action feel more dynamic, and when they learn that the twins have good reasons not to trust the Avengers, it causes further doubts and division in the team. With all that said, this movie is a bit overstuffed. Not because it’s got too many superhero characters – it never feels that way. It feels overstuffed in terms of a complex story, a few too many sub-plots and perhaps a few too many cameos. War Machine is a welcome addition, and it’s nice to see Falcon appear as well, but the scientist from the Thor movies feels unnecessary. In its cut form, the scene with Thor in the cave pool is kind of pointless (the extended version in the deleted scenes is better, despite what the test audiences said). In addition, you’ve got an indirect introduction to Wakanda and one of Black Panther’s villains, Ulysses Klaue (played by Andy Serkis). You’ve got the sub-plot about how different parts of the world see the Avengers, yet only Sokovia gets any real focus. That Sokovia opinion aspect also changes on a dime during the climax. Nobody protests being evacuated from the city by the Avengers, despite throwing fruit at Iron Man’s drones during the opening action scene. There’s also a romantic sub-plot between Black Widow and Bruce Banner that just doesn’t feel natural. Black Widow was mortified by the Hulk in the first movie, and they rarely interacted outside of Natasha tracking down Bruce at the start of the movie, and later being chased by The Hulk in the Helicarrier. There was even a minor controversy over a line Black Widow said at Hawkeye’s home during downtime. After describing the “celebration ceremony” where the Red Room sterilized her, she said that Bruce isn’t the only monster on the team. If you watch the full scene, she’s obviously talking about her past as an assassin for the Russians and this controversy is blown out of proportion, but it’s also an unnecessary line that doesn’t help sell me on their romance. The twins, while visually interesting in a fight, also aren’t given that much characterization. Their motivations are explored well enough (their parents died in bombings that used Stark tech), but they don’t get that much personality. Quicksilver’s personality basically extends to a handful of quips about his speed. The Scarlet Witch doesn’t fare much better, with only a moment of weakness during the climax separating herself from a caricature of a determined warrior with magic-like abilities. Thankfully her character is greatly expanded on in both Civil War and Infinity War. As for Quicksilver, I didn’t really feel anything when he died in this movie, and I still don’t. That said, while Quicksilver is a lot more entertaining in X-Men: Days of Future Past, he is more faithful to his comic book counterpart in this movie. You could also say that his speed abilities are a bit too powerful in Fox’s X-Men franchise. More so in X-Men Apocalypse, but still. I also felt like, while Ultron is clearly a threat to the Avengers, he seemed to go down a bit too easily in the end. The solution was to just have Iron Man, Thor and Vision shoot energy at him at the same time, heavily damaging his main body. Meanwhile, the Avengers managed to tear apart his army of robots in what felt like a somewhat anti-climactic conclusion. It also doesn’t help that the climax feels like a rehash of the first movie, with the Avengers fighting an army of identical looking enemies. In short, while Age of Ultron is still a good Avengers movie, it would have benefited greatly from some decluttering. If you removed half of the sub-plots and replaced them with more focus on the remaining sub-plots and expanding on the twins as characters, you would have had a much stronger film. I would still recommend this movie as a whole. It’s still a good Avengers movie, with some great action, some fantastic character interactions and some great setups for both Civil War and Infinity War. It’s just got too many flaws to call it a great movie, even if it had all the elements to be great. Next up is Ant Man, which is the smallest scale MCU movie since The Incredible Hulk, no pun intended. After that, it’s Captain America: Civil War, followed by Doctor Strange. This is the point where the MCU as a whole really starts to ramp up its release schedule pace. As much as I’m not close to being sick of these movies yet, I kind of feel like the MCU could benefit from a year off after Spider-Man: Far From Home, to give people a chance to breathe. I haven’t yet decided whether I’ll jump ahead and do a Captain Marvel post in this fashion after I see it, or, write a short first impressions post and gather my thoughts for a more detailed post later. Either way, I’m planning on seeing it, but my excitement has waned quite a bit over the last year. The fact that it’s getting mixed reviews doesn’t help. That said, I’m really looking forward to both Avengers: Endgame and Spider-Man: Far From Home. This entry was posted in comics, movie review, movies and tagged aaron taylor-hohnson, age of ultron, andy serkins, avengers: age of ultron, black widow, bruce banner, captain america, chris hemsworth, clint barton, comics, disney, don cheadle, elizabeth olson, hawkeye, hulk, incredible hulk, iron man, james rhodes, james spader, jeremy renner, joss whedon, kevin feige, mark ruffalo, marvel, marvel comics, marvel studios, movies, natasha romanova, nick fury, odinson, pietro maximoff, quicksilver, robert downey jr., samuel l jackson, scarlet witch, Scarlett Johannsen, SHIELD, sokovia, steve rogers, superhero movies, the avengers, thor, tony stark, ultron, Ulysses Klaue, wakanda, wanda maximoff, war machine. Bookmark the permalink. I agree, I enjoyed Age of Ultron as well, but it is a bit overstuffed with characters and subplots at times. Its still a spectacular movie, but doesn’t quite top the wonder and charm of the first Avengers film IMOP. It was a fun movie indeed, but man did it feel messy. Ultron also didn’t feel as threatening as I would have wished him to be here, personally. The romance was also super odd. If anything, it’s the weakest Avengers movie so far, and probably all-time! Great review though!